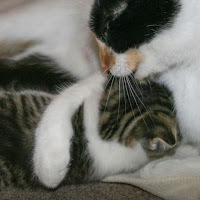 Dear Reader: Our mom, Carol insisted on giving us a long talk about OTHER cats & KITTENS & says with all the kittens being born in spring we must do our part to assist in adoptions. 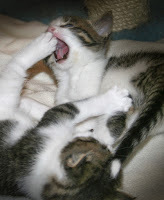 After all, we were recently past kitten hood ourselves when we ended up in our pickle. 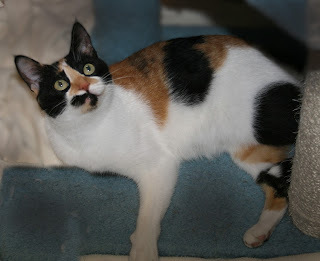 So last week Carol went to "OUR COMPANIONS" in Ashford, Connecticut and met ANOTHER CALICO named COOKIE. I'm going to give you a licking, SIS! Carol said that for Part 2 of Adopt-A-Cat month she wants to feature this cozy "feel the love"
amazing sanctuary in Ashford, Connecticut, where most of our sister cats get to hang out in living rooms, sunny porches, kitchens and even an outdoor CATIO! 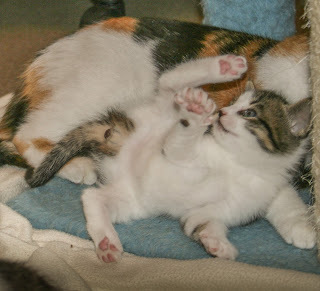 Calico COOKIE has 3 sisters & they were all abandoned, how do you like that? 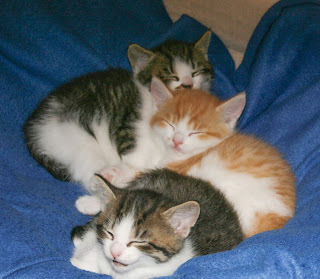 But the wee ones, Biscuit, Graham and Keebler, who were born May 6 look pretty at ease don't they? Carol says Cookie and Our Companions sanctuary are taking good care of them! We wish they could visit us but they are still a little young. She'll be posting more about Our Companions this week, the kittens and also and also will feature adult cats like us - she promised. 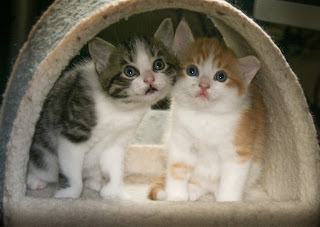 You can visit OUR COMPANIONS SANCTUARY by clicking on their name before. It's worth the visit! Hey we're all scrambled up here! OMC their names just KILL me!!! Th.iey are all so adorable. We hope everyone finds a forever home soon. Aw, they're so cute! We purr that they all find furever homes. You are all just so lovely. 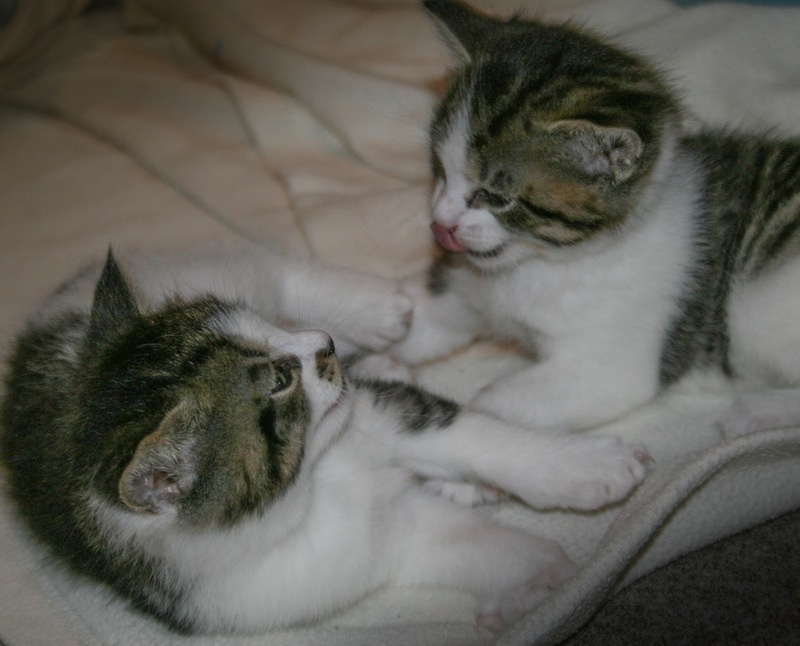 We hope you will soon find your forever homes and have wonderful families to care for you. AWWWWW! Hopefully the three “crumbs” will never know life on the streets. Aaaaaaw they awe cuties awen't they. We sure hope they all find luvvin' furever homes. We sure wish the Crumbs good luck! hay ewe wee small kittehz....Emily, Roxy and Whiskers iz total lee awesum names but de namez ya haz now iz even way kewler !! we hope veree one finds ther forevers, by de end oh joon & how kewl if ya could go two gether...... ta de same for everz home ! !